The Early Bird rate of € 1.791,00 expires after 18 May 2019. Register now and receive discount! Requirements. The most crucial part of development. You can overcome poor planning; you can overcome poor coding. But nobody has ever succeeded with poor requirements. Requirements are the underpinnings for whatever you intend to build, whether it be software, hardware, consumer product, service or anything else. Simply put, only the right requirements will get you the right solution. Requirements discovery is no longer about producing large, unreadable (and often unread) specifications. Requirements today is done in an agile manner, uncovering the real needs of the problem space, understanding the needs of the people who use your solution, and then, in a timely manner, delivering requirements and stories that are concise, clear, testable and correct. This workshop, presented by a real business analyst, gives you a thorough and well-established process for uncovering the real requirements, testing them for correctness, and ensuring that all the requirements have been discovered. The process is used with variations by both agile and traditional projects. It starts with the business, for it is only within the business that you discover the real needs. When you know the real needs, it becomes possible to determine what will best serve those needs, and to write the requirements or stories to build the right solution. Write the right requirements and stories. Yes, if you want to be involved in delivering the right systems—the ones that get used. Your title is probably business analyst, systems analyst, product owner, project leader or manager, requirements engineer, consultant, product or program manager or similar. Team members on agile projects benefit from understanding how requirements are best done in agile projects. 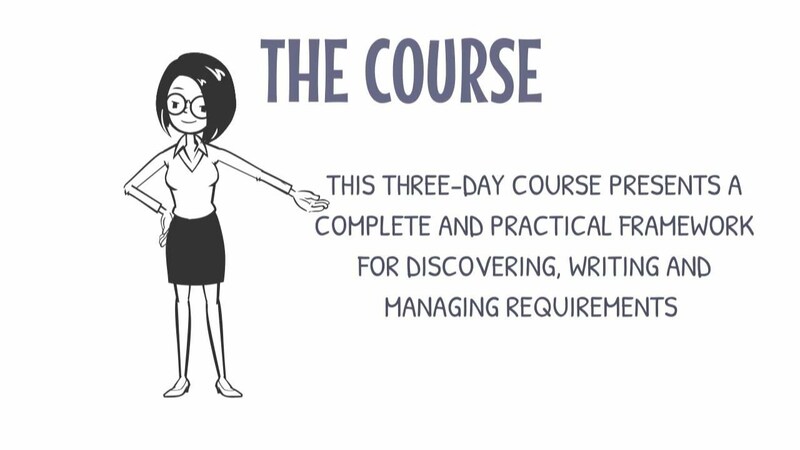 Users, software customers and business stakeholders have found that this course equips them to participate more effectively in the requirements process, and so ensure that the end solution matches what they really need. 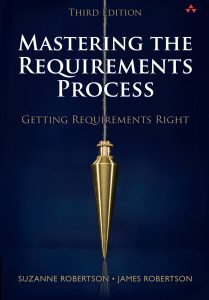 You receive a free copy of the third edition of the best-selling book, Mastering the Requirements Process – Getting Requirements Right by James and Suzanne Robertson. Volere was introduced in 1995. Since then, the Volere approach to requirements has been used by thousands of projects. These range from the conventional commercial domains such as banking, insurance, and so on, to more exotic areas such as air traffic control, aviation, automotive engineering, real-time control of appliances, telephony, and many more. The techniques were originally developed by James Robertson and Suzanne Robertson. Since their introduction, they have evolved as a result of research and application. James and Suzanne Robertson have continually introduced improvements as their clients have continued to push the requirements envelope. Today, Volere is a trademarked brand owned by the Atlantic Systems Guild. There is a network of consultants, instructors and agents around the world that are available and qualified to help you get better value for your investment in requirements. The Atlantic Systems Guild is a recognised training provider of the International Requirements Engineering Board (IREB) for both the foundation level and the advanced level syllabi. Please note: the number of attendees is limited. Please register early! At the top of this page you can download the PDF brochure of this workshop. James Robertson has been associated with hundreds of projects. From this rich experience he has witnessed time and again that development efforts only succeed when they profoundly understand the problem to be solved, and derive a solution that elegantly delivers the needed functionality and qualities. James is the author of six books, numbers courses, video instruction, and many articles and talks that have provided insights to better business analysis. Adrian Reed is a true advocate of the analysis profession. In his day job, he acts as Principal Consultant and Director at Blackmetric Business Solutions where he provides business analysis consultancy and training solutions to a range of clients in varying industries. He is a Past President of the UK chapter of the IIBA® and he speaks internationally on topics relating to business analysis and business change. Adrian wrote the 2016 book ‘Be a Great Problem Solver… Now’ and the 2018 book ‘Business Analyst’. The hotel is very well accessible by public transport. From busstop ‘Kanaleneiland Zuid’ it is only a three-minute walk. You can also take the tram line 60 or 61 from trainstation Utrecht Centraal and get off at stop ‘Kanaleneiland’. Please consult www.9292.nl (door-to-door journey planner, also available in English) or call 0900-9292 (travel advice by phone, € 0.70 p/m). Van der Valk Hotel Utrecht is also located next to the highway A12, exit 17 (Utrecht / Jaarbeurs / Kanaleneiland). Although the hotel has a large parking garage, we cannot guarantee parking spots. We therefore advise you to go by public transport. For those who would like to arrive the day before, there is the possibility of staying at the Van der Valk Hotel Utrecht. However, the hotel does not provide special discounts for attendees of events. Therefore, when interested in an overnight stay, please consult Van der Valk directly to make a reservation. 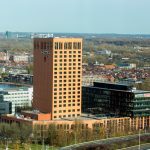 More information about the hotel and the location can be found on their website www.vandervalkhotelutrecht.nl. Practically all of our seminars and workshops can be offered as an In-house course for your company exclusively. Sometimes as a shorter version or if need be as an extended version with more detail or exercises or with extra focus on specific topics that apply to your organization. Process Change in Agile Timeframes This course shows how to discover and scope a business process, clarify its context, model its workflow with progressive detail, assess it, and transition to the design of a new process by determining, verifying, and documenting its essential characteristics. What is the role of BA in agile projects? Business analysis is investigating the work of the business, and finding both the problems to be corrected and better solutions for the business processes. 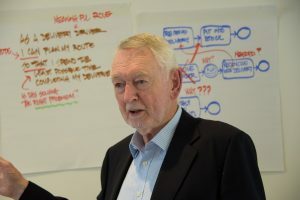 Adrian Reed provides a pragmatic approach to business analysis and agility in this 2-day workshop. (Dutch spoken) Workshop hosted by BPM specialist Christian Gijsels on analyzing, modelling and simulation with the latest release of Enterprise Architect, version 14. Archimate, BPMN modelling, DFD, UML. © Adept Events is a registered trademark of Array Media B.V.